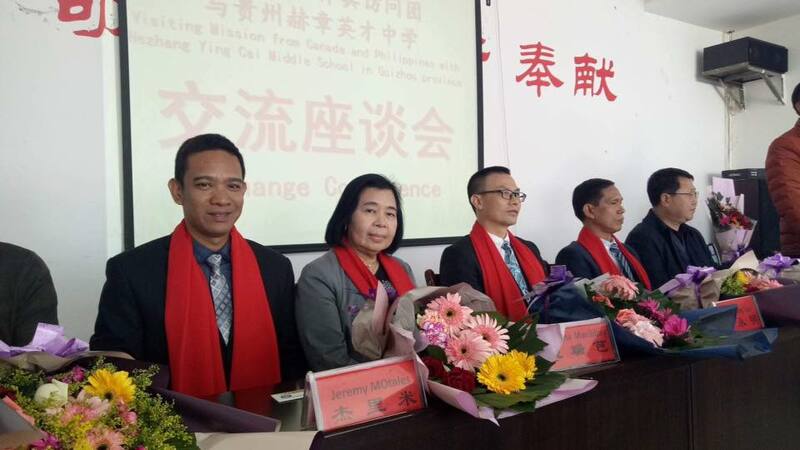 Dr. Agripina B. Maribbay (Vice President for Academics) and Dr. Jeremy Godofredo C. Morales (Director for International Relations) visited Guizhou Province in the People’s Republic of China on March 5-10, 2018 upon the invitation of Dr. Yang ChangHong (President of Guizhou Private Schools Association and President of Guiyang Xingzhi Occupational School of Science and Technology), and Mr. Wu Guocai (President of Guizhou Occupational College of Health Professions) in partnership with Dr. Luo YongMing (General Manager of Famous Maple International Education Group which is a partner of SPUP) for institutional linkages, promotions and marketing in China. The party visited various schools such as Guizhou Occupational College of Health Professions, Shuli Middle School, Jiusi Experimental School, Yachihe High School, HongHu Middle School, Guiyang International Kindergarten School, Xingren Middle School, Hezhang Ying Cai Middle School and Huaxing High School in Tongren City, Guiyang City, Bijie, Xingren and Hezhang respectively, all in Guizhou Province, to meet with administrators, faculty, staff and students and introduce to them St. Paul University Philippines, the program offerings and services – from basic education to graduate school. SPUP’s recognitions such as ISO Certification, international accreditations, Centers of Excellence and Development, various awards, and its inclusion in the list of Chinese Ministry of Education for overseas education blended with the university’s practice of caring environment and thrusts for global education and internationalization were highlighted in the said visit.